Irving Mitchell Felt oversaw the relocation of Madison Square Garden to the site of the historic Pennsylvania Station, resulting in the demolition of the original building. Irving Mitchell Felt, a New York City native, was born on January 25, 1910. He was raised on 140th Street in Manhattan. Felt graduated from the Wharton School of Finance of the University of Pennsylvania at the young age of 19. Soon after graduating, he joined Wall Street’s Hayden Stone but then moved to the investment firm of Graham Paige, where he truly left his mark. Felt quickly became the president of Graham Paige, and helped the firm gain control of Madison Square Garden. He chose to relocate the Garden to West 33rd Street and Seventh Avenue, opting to demolish McKim, Mead, & White’s Pennsylvania Station to do so. 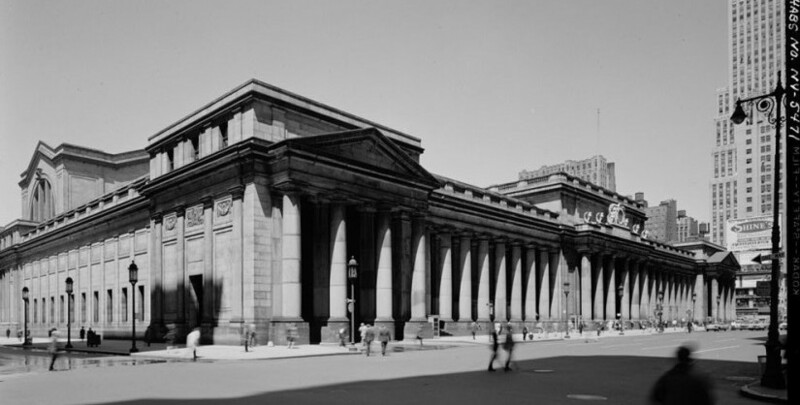 Penn Station's demolition was a great loss to New York preservationists. Many activists, including James Grote Van Derpool, the executive director of the Landmarks Preservation Commission, felt they had failed to call enough New Yorkers to action to save the station. Agis Salpukas, “Irving Felt, 84, Sports Impresario, is Dead,” The New York Times, 24 September 1994. Matthew McAllester, “Irving M. Felt, 84, Headed Madison Square Garden,” Newsday, 24 September 1994. Anthony C. Wood, Preserving New York: Winning the Right to Protect a City’s Landmarks (New York: Routledge, 2008), page 280.